If you pop in at the arena I go to every Saturday from 2:15 to 3:00, you won’t find much. Gleaming, shiny, smooth, cold, beautiful ice, yes. Random pop music playing on the radio. A water fountain. And that’s it. That and just a few people going round and round in circles.. and yet I’ve learned a bunch from them and skating with them. Weird, I know. But it’s true. You learn to look out for others other than yourself. See, the great thing about indoor rinks and early free skates is that practically nobody shows up. Which is good for us people who don’t want to be smacking into someone every other second. But it also means you can see more people fall. Especially little kids. And I guess what you do from then is up to you. You can just keep skating, or you can call out an “Are you okay?” as you skate. I prefer the latter, and apparently a bunch of other kids do. It’s actually how I’ve gotten to know some people at the rink. Most of the time you hear a “yeah, I’m good!” from those plucky kids with the little bit too loose skates, but occasionally you’ll get the “you know my brother? Yeah, that guy? Don’t trust him! Believe me, that’s worth it. And then you have the tiny babies who’re learning to walk on ice and you have to stop to watch them toddle and it’s. so. adorable. you. can’t. even. my. heart. So yeah, you notice other people. Mostly so you don’t hit them. There’s plenty of room for improvement. Every time, there are these guys. You know the type. The awfully amazing speed skater/hockey player/ice dancers who are seriously so good everyone’s left in the ice shavings their skates make. You think you’re doing good, then whoosh! There’s some guy going at the speed of light right past you! If you’re me, you either a. groan b. skate faster to try to keep up with these guys. And half the time, they’re nice and don’t mention it. They might even give you a few tips, like this one helpful fellow last Saturday. And I mean, everyone falls here, so no prides to worry about offending. Which is great. Finding a balance is important. Once in a while you get those mini panic attacks that happen when you lean just a bit too much and you flail your arms and shift your skates and hope to the Zamboni you don’t fall over, and that, my nonexistent dear, is where balance comes in. Focusing on not toppling over, focusing on your balance is seriously important stuff. For life too. But mostly skating. When you fall, get back up. The first thing I learned when I was first learning how to skate was to fall. I was five. Falling was my expertise. I fell a whole lot, and usually my skate time would be worrying about if I’d fall. And the second thing I learned was to get back up. It’s okay to fall, but it’s even better if you get back up and do it again. And again. And again. Don’t give up. it’s hard, but it’s pretty simple. Get back up. Boy, you won’t believe how easy it is to get up when you see a kid half your size sprawl over and immediately pop back up and dash on the ice, crowing, “skating is fun!” while a whole hockey team is telling the little guy to slow down, for goodness’ sake! Cause if that kid can do it, so can you. Unless it’s fit into a tiny hole. Then you can’t do it even if the kid can. School’s been very mean to me. It drones on and on and on anon and then suddenly, “please prepare for a test on section 4A.” Woah, where did that one come from? *mind explodes* I’ve been watching it for at least the sixth time today and I have too many theories that will probably kill me. I’ve also been waiting for anything on Album 66: Trial By Fire and my head hurts with all the possibilities of 1. Skint kidnapping Buck, 2. Buck being adopted, 3. a literal fire. Also, we do need to ask the question WHEN WILL JILLIAN DIE? Life’s been hard. There’s been so much tension and tiredness and homework and questions and times when I need. to. get. out and anxiety about the future and frustration and perpetually gritted teeth and always having to push yourself harder and harder even when nobody could care less or has to and screaming and fighting and praying and dying and I just need some peace today and tomorrow and for every second Sunday in May and it’s so hard to believe God is good even when He is and we’re out of bread and I gotta finish and I can’t remember the dratted reference and I’m okay with giving up right now. Don’t we all? Something tells me I’m not the only one who’s had one or all of the above and much worse. And then I gotta re-learn how to trust again. I gotta re-learn that God is good and He is love and He won’t leave when the guns growl, which is handy because right now I’m afraid I’m short of ammo. So if you want to swap prayer requests, let me know. And nobody wants to admit that. Nobody wants to admit they’re a quitter. Everyone wants to be the tough hero who gets the job done no matter what the cost. I really want that. I want to prove ’em wrong and wrong and so wrong… even when they’re right. I guess I’m learning that burden was never mine to carry. That it was God’s all along. Maybe some things shouldn’t be posted. I know I hate that long post that just lines on about how hard and sad life is, yet here I am writing one just like that. Why am I doing this? If reading this can help someone, anyone, then it’s worth writing this drek down. So yeah, that’s where I’m at. I’m staying up ridiculously late to reads books and waking up ridiculously early to write them. I’m skating backward and falling forward and laughing. And mailing a letter or two. Oh, and I got up at the crack of dawn for a lousy rendition of We Three Kings, so if you’re interested in notsogood and notsobad music, here you go. Been wandering around taking random pictures, snapped this lovely one (ha!) and I guess I’ll leave it here. Good grief that mirror isn’t even the cleanest! Well, it’s life. The less people feel pressured to display a perfect life on the screen and actually live, the better. The far, far better. And I know I’ve been tempted to do that. To show this aesthetic rose tinted life that’s full of roses and daisies and is just so Chikfila sweet tea wonderful. But it’s not. That doesn’t mean my life isn’t wonderful. Or that God isn’t working in it. Because He is. More glory to Him, and less to me. I’m 110% okay with that. I don’t want to open a can of worms. Okay, you know what? I do. I want to open this can of worms because it’s been too long. This stigma with special needs kids, with “disabilities” needs to end. I know nobody reads this but at least it’s out there. Waiting for maybe someone to see it. Don’t worry, I actually kinda know what I’m talking about this time. My brothers are autistic/ dyslexic/ have Asperger’s. And guess what? That doesn’t make them any lesser than anyone else. Okay, so here goes…. Know that there are different kinds of autism, based on a spectrum. See, this is the thing people don’t understand. They might come across a really jumpy kid who won’t register a thing they say, and they’re like, “ohh, that’s autism? That makes sense,” but if they see another kid who’s pretty normal, except for some minor differences, they won’t believe it. Welcome to the spectrum. It’s like wearing glasses. For some they need it because their eyesight is bad, others for reading, and others because one eye looks like an egg. Or something. See, there are varying kinds of autism and that’s not an indicator of how disabled you are. It’s an indicator of how your mind works. Some kids zone out completely, they don’t hear anything or anyone and live in their own world. Other kids are sociable, but everything they say seems pre-recorded, and they repeat stuff a lot. Still other kids are normal- but then just a smidge different. Some have treatment, and others don’t. So don’t go thinking all autistic kids are in the same boat- because the differences can be drastic. Know that autism is NOT a disability. People always avoid my brother because when they talk to him, he speaks in soft, quiet monosyllables and because they don’t understand. But if you know Jacob, you’d know he carries a lot of work wherever he is, he’s the friendliest soul around, he’s a major Cars nerd, and he loves Ferdinand. You’d also know he doesn’t like people yelling, too loud sounds, or questions pointed directly at him, like, “What’s wrong?” It’s not that he doesn’t know the answer, it’s that he can’t communicate with whoever’s asking because he communicates in different ways. Jeff, a kid I babysit often, has a different form of autism. He always has this thing with lights. Turn ’em on, turn ’em off, give someone epilepsy with toggling the switch; he’s fascinated by lights. Now if you ask him what’s wrong, he can’t tell you because you’re just in the background to him. Are these kids “disabled” or “mentally challenged” because of this? No! I mean, if you were to apply that reasoning for autistic kids like that on me, I should be having ADHD or dyslexia or something. Lemme ask you. Are people who wear glasses disabled because they can’t see properly without them? You know as well as I do the answer is a flat no. Stop, stop, stop, stop, for the love of everything sane in this world, stop treating older kids- and anyone with autism- like they’re not capable of thinking and understanding. Lots of people have tried to figure out Jacob every way possible except the understand-the-way- they- think-and-communicate-on-that-level method. Maybe it’s too much work for them, or maybe they don’t think they should bother. How about not bothering at all? In the past week, I’ve seen my brother threatened with bodily harm to stop crying, demanded to know what’s wrong, told big boys don’t _____ or _____, had people say out loud that they hope he grows up and make sense in front of him like he won’t be hurt because he won’t understand. I know about a quarter of you mean well. But often those people do the most harm. Fortunately for Jacob, he forgets people’s cruel blunders better than I do. The truth is..he can 100% understand you if he wanted to. Unless you’re shouting or he doesn’t like the topic. Then he’ll go off to another thing to do, because you aren’t interesting. Which frankly, is my common response too. Not all kids can though. Some kids need to go to a school (my brother does but we can’t afford it) and need treatment. That doesn’t mean you have any right to treat or think of them like vegetables. So if you’re in a situation where anyone, autistic or not, is a. crying b. panicking c. not responding to you, how about NOT saying, “big boys don’t cry/panic/ not respond”. Thank you. Of course, unless you run into me. Then there’s a difference. I don’t want to make Jacob the poster child for anything. Because he isn’t perfect and can get on my nerves like everyone else in the planet. I want him to have a normal happy life with people who understand. Maybe if more people actually knew about autism, they’d think differently. There are too many assignments to finish. Wayy too much. *groans* Come winter break and save me! Ahem. Anyway, one of the assignments is to write a narrative about a frightening experience from life… and publish it. By BJU definition, apparently, “publish” is to put it out so people can read it. not just show it to your teach- mom after you’re done. This wouldn’t be one of the first “school” assignments to pop up here, and it won’t be the last, lemme tell ya. I gotta write a newspaper article- or at least a good mock copy. *facepalms* So. uh. Here goes nothing. It was my uncle’s church’s camping trip, and my family decided to take all five of us kids, a giant tent, and drive over to Ajax, I think it was. I’d thought it was the coolest thing ever. Being a city kid didn’t give one enough safety or space to explore, so camping was as rare as hot dogs on a Monday night. We’d eagerly set up the tent, jumped on the airbed til the air leaked out, and changed into our swimsuits when Dad told us about the camp pool. I can still remember what it looked like, though my memory needs to be jump started with old pictures to properly see the place. The cabin had a nice, oak scent to its lacquered wooden walls, but the pool had a different scent of its own. It smelled nice and clean and.. inviting. The water most certainly was, with the light from the wide glass windows glinting off the shimmery water. My sister and brothers jumped into the water without a second thought, while I stayed right at the edge, the water lapping my feet. See, I didn’t know how to swim. To a five year old such as myself, however, it was exciting enough to lightly hop into the clear blue water and paddle. But for my dad, well, he was pretty sure I could do more than wave my arms while my feet were securely entwined around the railing. “How ‘bout you swim over to me?” Dad called from where he was. To my tiny one foot tall self, it seemed he was a gazillion miles away, when in reality it was probably one stroke. Talk about pathetic. “Um, no thanks!” I chirped from where I was, much preferring to float inside my little safety vest. Just then my sister and oldest brother swooped past me, engaged in some kind of race. I suddenly wanted to join them, and let my feet go from the railing, my hands paddling to the middle of the pool. It was fast, sudden, dark . I somehow plunged down into the deep darkness below. Well, it wouldn’t have been so dark if I’d trusted my goggles and opened my eyes. But no, I didn’t. The water surrounded me as I sank deeper and deeper, my ears only hearing things muffled and my heart pounding. It was just a game at first, and I could play it. I shut my eyes and held my breath as I headed deeper and deeper into the pool. I thought it was exciting, fun, that I could propel myself up like in the stories and break into the surface, that until then I could blow bubbles out like Captain Hook. But then it got scarier. I couldn’t hear Dad, or Joseph or Jacob, I was running out of air to blow bubbles, and no matter how hard I flapped my arms, I couldn’t get out of the that horrible, horrible dark water. The water engulfed me, just like the paralyzing fear that I was gonna drown. And I couldn’t scream. That was the worst part. Besides from the fact I couldn’t breathe. Quickly, suddenly, someone, something plunged into the water and pulled me out, and everything reversed. I could see light again- light! And I could breathe, and feel air. And scream my head off as I clung to my sister’s shoulders. “I want to go home! I want to go home!” I cried as Dad wrapped me up in a little towel and sat me on the side, far away from the water. I was never gonna do that again. Ever. Then my sister and all three brothers offered to carry me on their backs like baby otters do with their mothers. I jumped back in, laughing like my near-death experience never happened. If you’re reading this, you just read like 500 words of drek! Congratulations! As a reward you get the link to the 4th carol and me leaving you alone until tomorrow. 🙂 A lovely day to ya! Monday. Dreadful, dreadful day. If Saturday brings out the best in us, Monday brings the worst. Yet today wasn’t all that bad. If you don’t count the dreary sky, aching everything, tension so thick you could cut it with a knife, and *gasp* participles. In all seriousness though, I’m grateful for the day. One, National Bible Bee Competition (Or Nats for short) started today. It’s unbelievably encouraging to see so many kids come out and own God’s Word and proclaim it, and I’m shook, to understate, to count myself one of the many who joined the Summer Study. Shook, grateful, blessed, have at the thesaurus. Two, I managed to get out another carol (yes, I’m sorry for buggin’ y’all it’s just really fun to play these hymns! 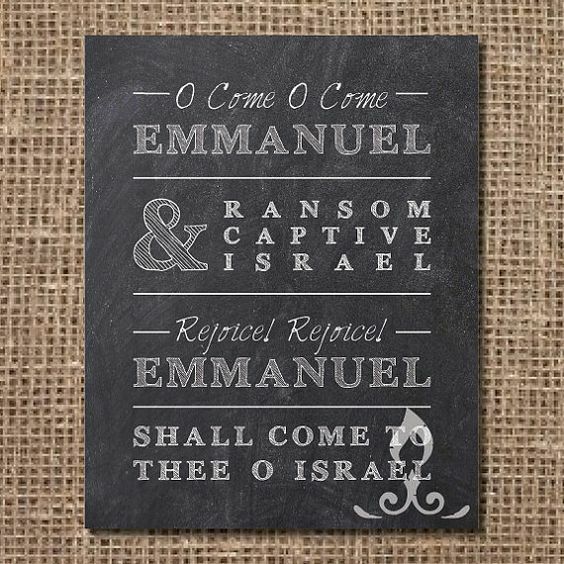 Even if my renditions are horrible XD) O Come, O Come Emmanuel brings yet hope for me, hope and a promise. She’s alone for Christmas, and somehow it hurts more and more every year. But come now, in the deep bustle in New York City, you’d think a few more people would be flying the day solo. Right? _Not a soul_, Andrea Marti thought bitterly as she looked around her, hand clutched on skateboard as she crossed the street. There was a couple walking in front of her, more like they were slow dancing to some music only they could hear, a guy eagerly holding his small- daughter, it had to be, she was so tiny, an old wrinkled man and an old wrinkled lady, laughing as they looked around at the gently falling snow. And some pigeon was nestled against a dog. A pigeon had a dog. Writing seems to help a lot with the craziness of life, and Just Come Home is almost done. I’m a mess of a writer. “Little annoying brat-how dare she say that about Mom the way she did..” Zeke muttered my thoughts, handing me a water bottle. He was being unusually kind and helpful, which meant I was in worse than I thought I was. He was the one who got Mom to check on me, apparently I was thrashing in my sleep or something. I don’t really wanna talk about it. But it was bad enough to let me stay home from school indefinitely. And I should know, my head was throbbing. And to think I wanted to publish this mess of a story. *sighs* it’s my mess however- so at least there’s that small comfort. Oh, no. you don’t want to know about my thoughts. That’s even more of a mess. Like how sometimes I feel bad for praying the same thing over and over but I know I mean it and it’s hard to understand that God doesn’t tire of me babbling the same thing; like how hope is something everyone wants but nobody quite knows how to get; like how heroes, even fictional ones, mean the world to us because if we’re honest we want to be the heroes; like how the mind can be quickly swayed by what’s around it; like how there should be an episode where Connie plans Trent and Mandy’s wedding cause how awesome would that be; like how the future seems super uncertain and trust is shaky; like how in the world is this month over already; like how am I gonna handle school and life; like why can’t I think straight for once. I have no excuses for this. 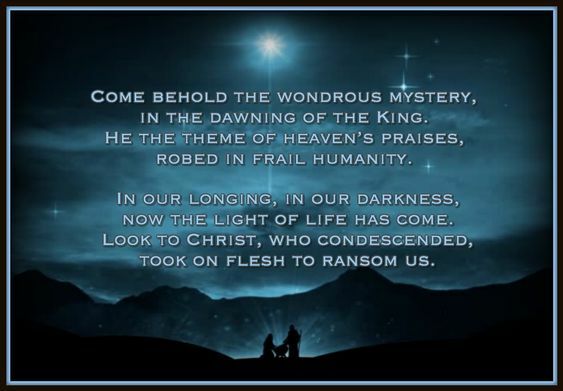 Come Behold The Wondrous Mystery is one of my favorite songs, not just because it’s not necessarily a Christmas song, and not just because Matt Papa is awesome (he is), but the message is.. well, of hope. And we could use some of that. Hope you enjoy the cover and aren’t too disgusted with me at the completely aesthetic-less background. Now the fun, semi better part! BIBPC! 😀 This is for the first category, cozy! Let’s see, what else is there that may be considered newsworthy? A Wrinkle In Time was a confusing, interesting, mind-boggling book, and I’m glad I read it. Like, really glad. But also really confused. XD Next to tackle is Neil Flambe And the Marco Polo Murders. This should be interesting. Currently enjoying The Winter Soldier because why not and plus it’s story research (I’m serious, y’all!) Sending emails and eating croutons. Planning for the next epic failure of a carol cover. And writing this wee story for Write Christmas. Looking forward to that.